I am obsessed with colours more than ever before and this style is proof. On other blogs, you will find a post like this as a mood board about colourful fashion, I say: Why not wear all these pieces together, just the way I show them? At least I would love to and declare this outfit to one of my dream outfits! I want ponies, I want rainbows, glitter and never forget about the pompoms! I remember brushing the hair of my Little Ponies when I was a child, I loved their pastel coloured manes. I think the first ponies have been made when I was born or maybe a little bit earlier and so they were about the first toys I can remember too. Wearing them on a jumper would bring up a lot of nostalgia. 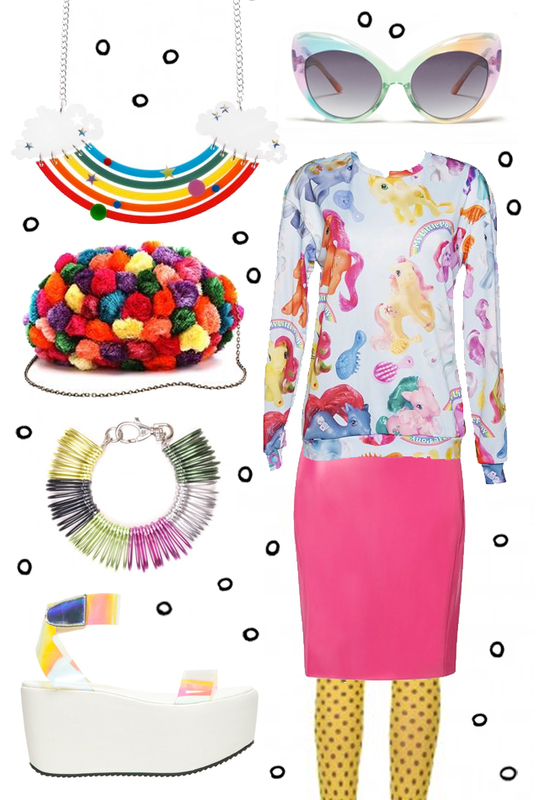 I am sure the ponies would love the pompom clutch and the colourful accessories as much as I do. What do you think about this outfit, would you wear it or just pick out one piece for yourself? I love it all, especially the My Little Pony sweater! :-D Glad to hear. I think I just have to order it as soon as possible.